If there’s one fish that could rightly be described as criminally attractive, it would have to be the painted greenling (Oxylebius pictus), or if you prefer, convict fish. Since I have not seen its mug occupying wall space in the post office, the latter moniker must relate to the six wide, red-to-brown bars that encircle the body and fins, and not to a checkered past. The colorfully patterned critter is usually no more than 6 inches long, with females slightly longer than males. A pointed snout fronts a head region, which sprouts four flexible, branched appendages (cirri). At first glance, the cirri may be reminiscent of antlers but they aren’t for head butting. They are chemoreceptors and function like taste buds. A network of nerves in the skin extends to and throughout the cirri, with the nerve ends left open. The circuit goes into action when sensory information reaches the nerve endings in the cirri. Information then travels to the skin to be transmitted to the skin cells. The sequence of events from here is not specifically known, but there must be a pathway from the skin that somehow connects to the central nervous system where the information is finally relayed to the brain and spinal column. 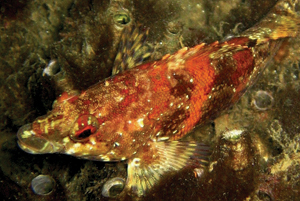 That chemoreceptors are also found in greenling lips suggests that animals with added sensory capabilities evolved to better survive in water blessed with generally low visibility. I frequently see painted greenlings in the La Jolla Ecological Reserve posed amid the rocky substrate like an arranged still life. The resting posture has much to do with the fish’s lack of a swim bladder, an unnecessary accessory for a fish that lives on the bottom, mostly sits and is garbed in a mottled coat color-matched to the hues of its habitat. Painted greenling camouflage must be the best revenge against predators like octopi, crabs, larger fish and cormorants (the eel-like black birds, excellent deep divers, would be lucky to catch a greenling meal). During breeding season, the male changes colors in a kind of semaphore to signal specific messages across a distance. For example, he may turn very dark or almost black to warn other males away from his territory, and then morph bright red to flag down a female. In contrast, the female turns brown. Well, who has time to fiddle with colors when producing the next generation? 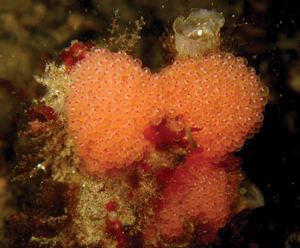 During the breeding period, a female lays multiple clutches made up of tiny fluorescent-orange orbs, such that, by season’s end, her grand total may top out at 28,000 eggs. Once the eggs are attached to substrate, such as the tube of a polychaete worm dwelling, the male fertilizes the clutch and perches nearby, vigilantly and aggressively guarding his brood until they hatch. He has no qualms about attacking other fish several times his size, much less divers myriad times his size. The painterly patterned greenling ranges widely, from Alaska to central Baja California. Active during daylight, it preys upon polychaete worms, crustaceans, small mollusks and bryozoans. Nighttime means sleep, and here is where things get weird. A painted greening may snuggle up to one of several species of anemone, and the anemone doesn’t mind. The symbiotic relationship between these strange bedfellows is called mutualism in which neither party is harmed. 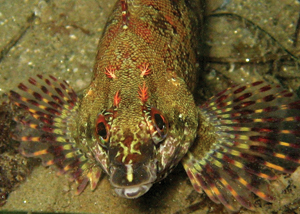 Because the greenling can and does live quite well without an anemone, the behavior appears to be learned, not innate. In studies, juvenile painted greenlings have been observed resting among an anemone’s tentacles, and when chased, they retreat into the anemone’s mouth, popping out when the threat disappears. Adults greatly outsize the anemones so they sleep curled against the anemone’s base. Most anemone species that associate with slumbering greenlings are not found in the La Jolla Ecological Reserve or San Diego waters, for that matter. An exception is the strawberry anemone (Corynactis californica). I have yet to witness this behavior, possibly because these anemones are not abundant in the reserve. It can’t be emphasized enough how exceptional this relationship is because while mutualism is frequently seen in tropical species (like clownfish and anemones), it is rare in temperate species. The liaison between a painted greenling and anemone has not been well studied, an oversight I may need to personally rectify.